Portugal and Denmark met last Wednesday in what could potentially be the end of the road for the Selecção if they didn't get the win they so desperately needed. Up against their nemesis - who were on the back of a somewhat fortunate victory against the Netherlands -, Portugal only had one way to go: forward. Both coaches chose to keep their starting elevens, as if stating that any adjustments that theirs side might need were minor. Paulo Bento had expressed his confidence in Postiga and explained how the role of a striker extends further than just goal stats, which eliminated any lingering doubts and hopes about the possibility of Nélson Oliveira starting the match. Morten Olsen, in turn, had no apparent reason to tweak a team that had frustrated the World vice-champions. Even though both the Portuguese coach and players had said that they were happy about their display against Germany and the criticism was ill-founded, the fact is that Portugal heeded the call for a more proactive game. 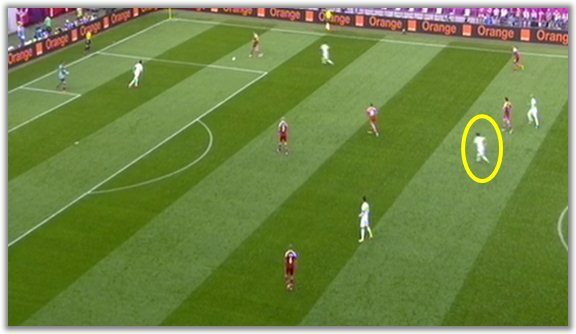 In fact, although the Portuguese defensive positioning wasn't criticised for being laid back, they stepped it up a notch and pressured the Danes near their box - it was clear that Bento had watched their previous match and wanted to keep Denmark from playing the ball out the back. Portugal wasn't willing to allow Denmark to slow the game down. and Moutinho (yellow) and Meireles try to win the ball back. 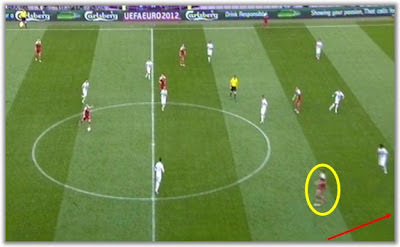 and Meireles (orange) offers coverage. While it's true that Portugal was trying to win the ball back as soon as possible, Bento was also interested in keeping Denmark from slowing the game too much and dictating the tempo. That away, the Portuguese would always be proactive and on alert. 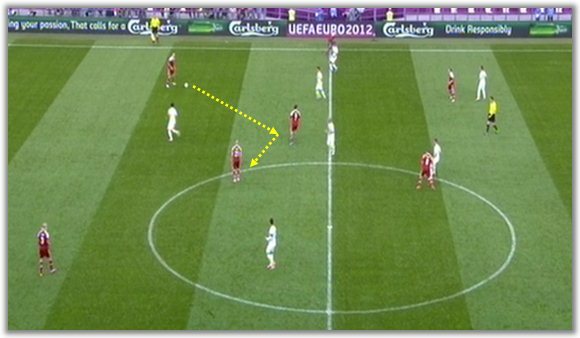 However, Denmark managed to avert this pressure a few times, namely through their go-to play - the ball goes from one of the centre-backs to the wing, one of the midfielders gets it back in the centre and quickly plays it toward the weak side. The ball comes from the wing to the central midfielders. 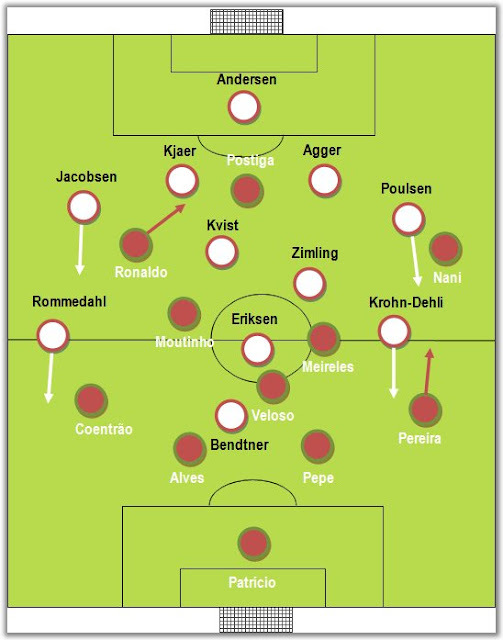 With a simple first-touch move, Denmark free themselves from the Portuguese shackles. Unmarked, the midfielder passes it over the top. Bendtner's (yellow) movement is critical, dragging Bruno Alves. The winger (out of the picture) has lots of space to run into. After the first 15 of intense attack down the right from the Danes, Portugal finally managed to stop the bleeding and started winning the ball back more and more. Not only were the interceptions further up, but Ronaldo was also better at linking up attack and defence, something Portugal lacked against Germany. 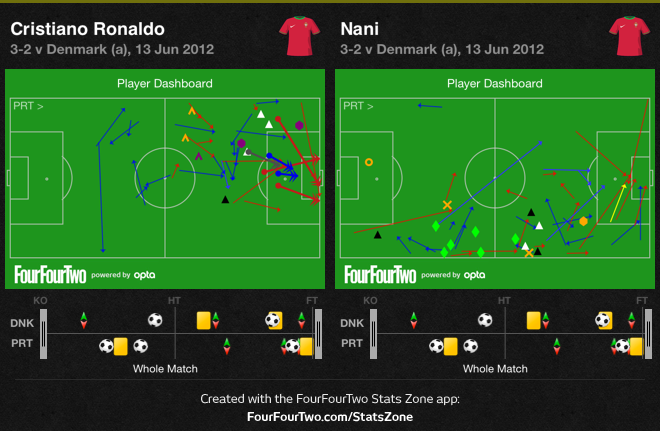 In fact, Ronaldo was so dedicated to it that he virtually left his wing unattended (more on that later). 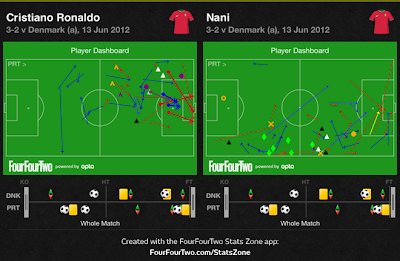 Looking at the dashboards, it's easy to see that Nani was more willing to track back. The first Portuguese goal was not exactly surprising - even if the way it was scored was. The Selecção seemed to have finally found their rhythm and every player was clearly more confident on and off the ball. Nani and the three midfielders were tireless workers when Portugal did not have possession of the ball and were particularly good in picking up loose balls. Indeed, the second goal was a perfect example of it and it meant a boost in morale for Hélder Postiga, the scorer. The match seemed all but over, but a Danish cross from the right a few minutes before half-time led to Bendtner's goal and a sea of uncertainty. Even though they weren't too successful, Denmark kept crossing from the right. With Veloso keeping the playmaker Eriksen rather quiet, Portugal were able to control the game, even if they were not dominating. Attracting their opponent into the trap, Bento's men kept allowing Agger time on the ball and pounce as soon as he misdirected a pass or tried to take one player too many, which led to numerous counter-attacks, two of which were wasted by Ronaldo and would effectively have killed the game. With no killer instinct and their usual profligacy, Portugal seemed to start to feel the pressure for a win and became nervous. Meireles and Moutinho both reverted to the quick-draw passing mode and the Danes were offered a way back into the game. It was by then that Ronaldo's instructions not to track back started making less and less sense, because while Olsen's men had tried to do it during the first minutes of the match, they had now no doubts about where to hit Portugal. Even though there's no need for a team to be symmetrical, it still needs to be balanced - which it clearly wasn't. Any (current and future) adversary of the Portuguese team will have chalked the hole on the left wing down in their playbook. Even though the huge gape and Coentrão's suffering was plain for everyone to see, Bento surprisingly replaced Postiga with Nélson Oliveira. While it meant that Portugal was now able to hold the ball up a bit longer, it failed to address the problem on the left wing and the Danish goal seemed in the cards. When Bendtner scored his second goal, it was hardly surprising at all. Varela somehow managed to score the goal that allowed Portugal to breathe a bit better for now, but this was a game that they should have won in a breeze, given Denmark's evident frailties in the organised attacking phase. In a tournament this competitive, not scoring when you have the chance means you probably won't be around for much longer. Notice how much more defensively active the right wing is when compared to the left one. If Portugal are to avoid crashing out immediately after progressing from the Group of Death, they must improve at dictating the tempo, score the opportunities that their good defending yields and, most importantly, address the huge gap that Ronaldo leaves on the left wing. If not, the Netherlands may just be the team to hurt them badly.